1988 in F3000, Herbert was caught up in a major accident at Brands Hatch, badly breaking his legs in a fearsome impact with the barriers. It was an act of huge bravery that saw him back in a racing car at the beginning of 1989, despite the fact he could barely walk. Even more remarkably, he was now in Formula 1, scoring points on his debut. In 2009 Lightspeed through the name Lotus announced the they would make an attempt to enter Formula 1 for the 2010 season with Johnny as the commercial ambassador and driver manager, It didnt work out. 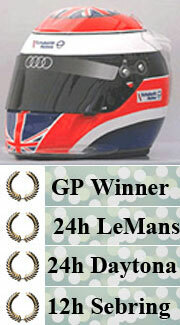 Since 1994 Johnny has run the 'Johnny Herbert Karting Challenge' - http://johnnyherbertkarting.co.uk.